Sheffield United are 6/1 with EFL sponsors SkyBet to win promotion to the Premier League next season. 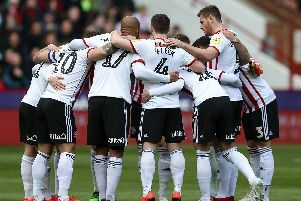 Although the odds will likely change when the season officially finishes, and the third club to be relegated from the Premier League is confirmed, Chris Wilder's Blades have been installed as joint tenth favourites for promotion, alongside Hull City, Wigan Athletic and Bristol City. Stoke City, whose relegation from the top flight was confirmed at the weekend, are current favourites at 11/4 alongside West Brom, who were condemned to the Championship last night. Brentford are third favourites at 9/2, with Brentford, Leeds and Sheffield Wednesday currently available at 11/2. United are 25/1 to win the Championship title, and 13/2 to be relegated. Speculation continues to surround Blades boss Wilder, linked with a move to League One side Sunderland, as uncertainty in the Bramall Lane boardroom continues. With the transfer window set to open later this month, Wilder is continuing to hold talks about potential new signings despite the on-going uncertainty surrounding his future in South Yorkshire.